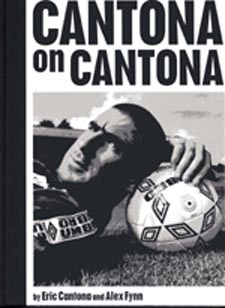 An interesting book, certainly an attempt to further Cantona's reputation as a "Philosopher footballer". (However, he has a way to go before he makes this illustrious squad.) Basically Eric gives his thoughts on a variety of topics, not exclusively on football, but philosophy, family, growing old etc. So not the normal stuff from footballers, which usually falls into the "I banged the ball into the net and then got rip roaring drunk" category. He does have some interesting things to say The work is also a photo album, exclusively black and white, designed to show our philosopher not only on the pitch, but in various poses that show his pensive side. I think they forgot to add the obligatory Gauloise hanging from the lips to get the full image of the unshaven French intellectual ranting against Eurodisney. Nevertheless, the photos are well taken. Obviously, in that sense it can do double service as a coffee table publication, which adds to the rather high cost. This book is "an official Manchester United publication", so it goes to show that the club figured they could make a buck off it. Since Cantona says only good things about MU, I'm sure they were doubly happy. This book is hard to rate. You have to give it high marks in the sense that it's different. On the other hand, it's hardly worth buying. Hopefully you can just see it on somebody else's coffee table to quickly flip through it.